If you are about to be engaged or get married, you are probably in the market for engagement ring and a wedding band. Like most couples, you and your fiancé will want to choose rings that will last for a lifetime. This means not only obtaining the perfect center stone; it also means choosing a setting that has the right metal. For centuries, several metals have been commonly chosen to all types of create jewellery, including engagement rings and wedding bands. Gold was used as far back as 3000 B.C. to make jewellery. Nevertheless, when the Egyptians discovered silver, its rarity made it a new favorite and was even considered more valuable than gold at some point in time. Samples of gold and silver jewellery before the 1st century are available in many museums all over the world – proof that people have recognised the value of these two metals for creating jewellery. Apart from gold and jewellery, other metals were used in ancient civilizations to make rings, necklaces, and other items for adornment. The Egyptians also used copper, and an alloy called electrum. Made of gold, silver, and some copper, this metal is mentioned in some ancient Egyptian texts. Couples today have quite a wide range of choices when they look through engagement rings and wedding bands. Technology has helped expand jewellery options because not only do you have gold jewellery, you can now have it in different colours. You can also have an 18-karat or 14-karat gold diamond ring, a yellow gold ring tinted with rhodium, or choose among the new metals that have surfaced as material for rings. 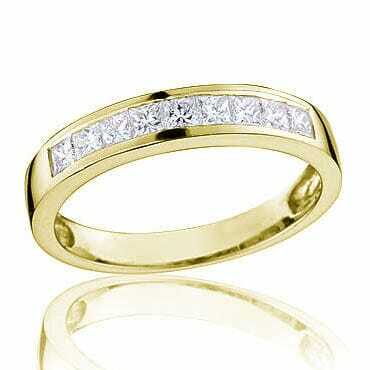 Gold is the most popular material for rings and other pieces of jewellery. There are many reasons for this popularity, not the least of which is the way you can get various shades and colours from this metal. With gold, you have white gold, rose gold, and standard yellow gold. Moreover, the shade of gold changes depending on the ratio of gold to other metals used for each piece. Gold is very lustrous, it does not tarnish, and it does not react with the atmosphere. It is a soft metal, which means it can easily be molded into intricate shapes. Apart from this malleability, one other very desirable property of gold is that it mixes well with a lot of alloys that lend it both color and firmness. In addition to all that, the value of gold has increased through the years – a fact that means a ring bought today will be even more valuable over time. The gold in jewellery is measured by karats (or carats), a term which refers to the gold content in proportion to other metals in an alloys. Jewellery that is 100 percent gold is said to be 24 karats. Pieces made of 91.66 percent gold are 22 karats, those that have 75 percent gold are 18 karats, and those that are 58.5 percent gold are 14 karats. Jewellers and goldsmiths agree that 24 kart and 22 karat gold is much too soft for durable jewellery, especially if used as setting for gems. The higher the gold content of any piece of jewellery, the more expensive it is. Most high-end jewellery will be made of 18-karat gold. The story goes that when a salesperson in an exclusive jewellery store in Rome was asked by a tourist how many karats a gold necklace on display was, he haughtily said, “Madam, in our store, when it’s not 18 karats, we don’t call it gold”. Majority of the jewellery using gold will be anywhere from 9 karats to 18 carats, with some goldsmiths actually preferring 14 karat to 18 karat gold when making extremely fine pieces. This is because 14-karat gold does not bend as easily; thus, providing a stronger grasp of stones, especially if fashioned as prongs as in diamond rings. The disadvantage in using alloys with less than 41.6 percent gold (10 karats) is that the other metals mixed with the gold may make the finished product prone to tarnishing. If you decide to choose gold for your engagement ring and wedding bands, remember that this metal can come in different colours or shades. Yellow gold. This is the natural color of gold and is probably the most common shade used in jewellery. Alloyed with silver and copper to strengthen it, yellow gold is a brighter shade when there is more gold in the mixture. Hence, 18-karat gold would have a richer yellow shade than 10-karat gold. White gold. Time and again, this shade of gold becomes the fashion trend. For years, white gold will reign as the preferred setting for engagement rings and wedding bands because of its cool, contemporary look. This shade comes from mixing gold with nickel, palladium, zinc, and copper. To create an even whiter look, rhodium is often applied as a final finish to the jewellery. Rose gold. A mixture of copper and yellow gold gives jewellery pieces a reddish hue. This shade is believed to lend a flattering rosy hue to the skin. The more copper the alloy has, the darker the rose tint is. 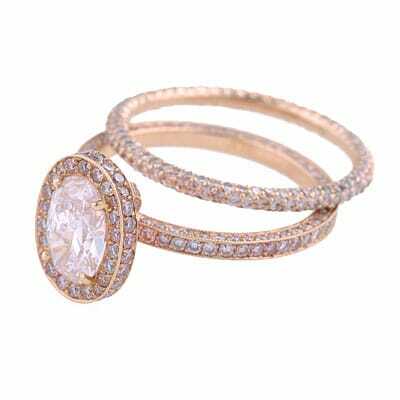 Thus, a ring made of 18-karat rose gold will be more subtle. Green gold. Gold is mixed with silver, copper, and zinc to bring out a slightly greenish tint to the alloy. The more gold the alloy has, the richer the shade of gold it will be. 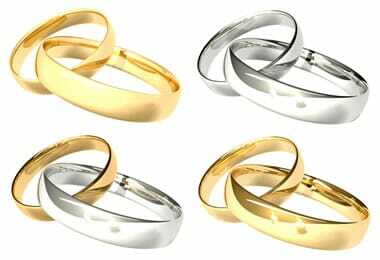 Today many practical couples will choose to have wedding rings made of silver because although this metal is precious, it is nowhere as expensive as gold. 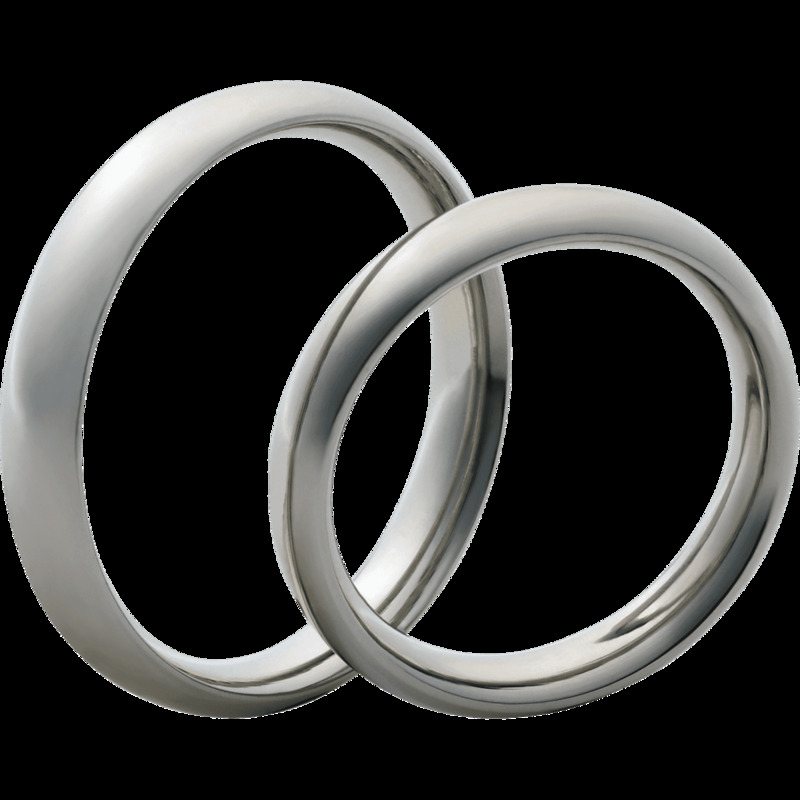 Many silver wedding bands are intricately designed, and a good number are fashioned as filigree bands or claddaghs, the traditional Irish betrothal and wedding ring. 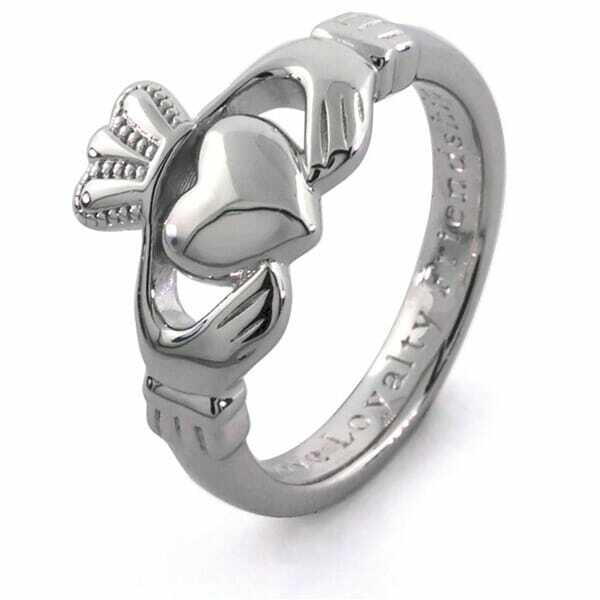 Although silver is a more economical jewellery medium than gold, stringent standard regulate the branding of this metal. Silver jewellery is usually made of 92.5 percent silver with 7.5 percent copper, a standard mixture referred to as sterling silver. It is then marked with the number 925. In the United States, an alloy has to be made of at least 90 percent silver before it can be marketed as silver. Another mixture of silver is Britannia silver, which contains 95.8 percent silver and 4.2 percent germanium. This mixture is more resistant to burning. There are many reasons why silver is a wise choice for engagement rings and wedding bands. First, you get a lot of value for your money when you choose silver; at a fraction of the price of gold, sterling silver will give you practically the same luster, especially when your jewellery is given a rhodium coat. Second, sterling silver is a hard and sturdy metal; if you plan to give your wedding bands to your grandchildren, they will certainly last long enough for you to do so. Third, sterling jewellery can easily be worn in combination with white gold and platinum. This means your engagement ring and wedding band would be easy to mix and match with other jewellery. Some couples choose platinum instead of white gold when they want engagement rings and wedding rings that have a sleek cool look. A platinum ring will feel substantially heavier than gold or silver. Jewellery made with platinum doesn’t need to be plated with rhodium because platinum is already very white and lustrous. It is the metal used for very high-end pieces because platinum is more expensive than gold. Unlike gold jewellery where you use an alloy that is only anywhere from 75 percent to 37.5 percent gold, platinum jewellery is almost pure platinum. This material is extremely popular among the rich and famous. 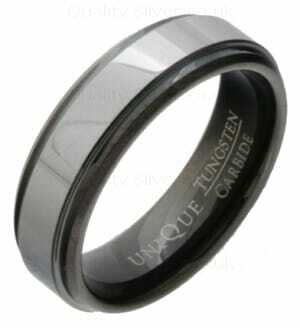 Titanium, with its grayish-silver color, is the hardest natural metal n the world. It is 300 percent stronger than stainless steel, twice as strong as aluminum, and a lot stronger than silver, gold, or platinum. However, in spite of its strength, titanium is an extremely light metal. It is also hypoallergenic, and does not react with the environment. This means that it can be worn safely while swimming in a heavily chlorinated pool, or in the sea. Titanium can be anodized to produce different colours. This versatile metal would serve well as material for engagement rings or wedding rings. This metal was discovered in 1791, much later than the other metals used for jewellery. The making of titanium jewellery started becoming common in the late 1980’s, and only before the end of the century did it become truly popular. 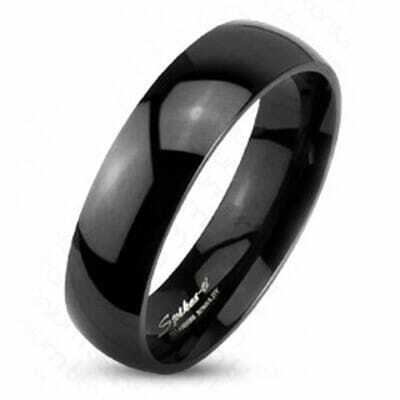 A titanium wedding band will probably last even longer than one that is made of silver, gold, or platinum. In the final analysis, when a couple goes shopping for their rings, they usually base their choice on the design of the rings, their durability, the gems used, and the cost. The metal that the ring is made with actually determines both the durability and “wearability” of these pieces of jewellery but these are not the reasons why most people choose gold, or why many will shell out more to buy rings made of platinum.